Awarta, a small village south east of Nablus, faces constant intimidation from the Israeli army and nearby Itamar settlement. In the past month, the Israeli Civil Administration handed out two land confiscation orders to residents of Awarta. The first one, three weeks ago, stated that 360 dunums of the village’s land will be confiscated and the second one, issued last week, confiscated 63.4 more dunums. However, residents of Awarta affirm that the actual total amount of land confiscated raises up to 1,500 dunums. As you can see on the map, the area confiscated is located around the settlement of Itamar, where farmers own hundreds of olive trees. While the confiscation orders are valid until 2015, farmers fear that Israeli authorities will renew them so the land and thus, all olive trees are now lost to Itamar settlement. The past ten years farmers have only had permission to visit this land once or twice a year, despite the fact that they have documents stating their ownership of the land. Three weeks ago, the 22 farmers affected from the first land confiscation order went together to visit the land but were denied access, only getting within 2km of the land before being stopped by the Israeli army. 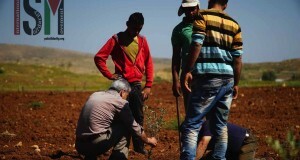 The farmers were attempting to visit the land due to the recent destruction of 300 olive trees and concerns that the 600 dunums of land was being damaged by chemical pollution from the settlement. The olive trees are the main source of income for the farmers but due to the threat of violence and the restriction of access from Israeli authorities they would never visit their land alone. When asked what are they going to do now, Awarta’s major said: “We have two ways of resisting, one, by appealing the order in the Israeli court and the other, by staying on our land. This is our land and we will never leave”. 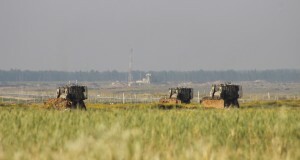 Located close to the Huwara checkpoint and military base, the village is designated within Area B but the surrounding farm land is Area C and therefore under Israeli civil and security control. The illegal settlement of Itamar, constructed in 1984, has taken 30,000 dunums from the nearby Palestinian villages of Awarta, Beit Furik, Rujeib and Yannun. Awarta’s land comprises a total area of 22,00 dunums. 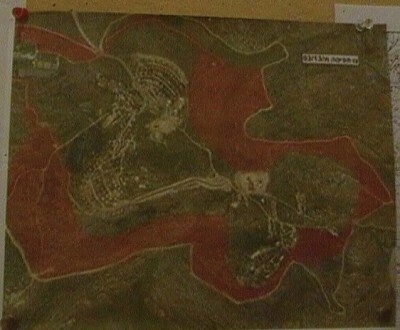 However, Itamar has taken 12,000, leaving the residents of Awarta with only 10,000 dunums, most of it located in area C. Israeli government recently approved a plan to build 675 new housing units in the settlement of Itamar, Of the 675 housing units, 137 are existing apartments that have now been retroactively approved.